The average American car weighs about 3,000 pounds. But to produce that vehicle, a lot more raw materials were used than its final weight! Maybe as much as 100 times more, as reported by scientists in a recent paper in the Proceedings of National Academy of Science. For this car to be produced, iron ore is mined in Australia and made into steel. Steel is then shipped to Japan and made into a car, which is then sold in the U.S. Most studies until now, measured national consumption by accounting only for the final weight of the products we purchase. “The rock where the iron was mined never leaves Australia,” says Thomas Wiedmann, the lead researcher, so it was not included in the account. But the scientist and his colleagues showed that most of the raw materials for producing the stuff we use are actually extracted overseas, so they could no longer be ignored. In the case of this car, they allocate the weight of the iron ore mined in Australia to the U.S. consumer who bought the vehicle. 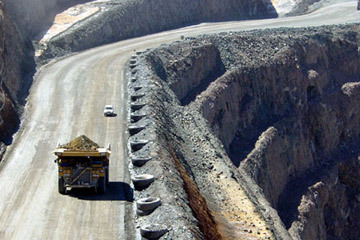 Open pit mine in Australia. Photo by: Rhett A. Butler. Using this new accounting, it turns out that on average, each of us in the U.S. uses 25 tons of raw materials every year to produce our stuff and our energy. That is the weight of about 20 cars. By comparison, the average Chinese person uses 12 tons and the average Indian only 4 tons of raw materials per year. Take another example: a newly built call center in India. The cement might have come from China, the glass was possibly sourced locally in India, but the whole purpose of the call center is to provide customer support to an American retail company. Who does that material footprint belong to? – The U.S. customers, according to the scientists. The researchers came up with the term “material footprint” as an analogy to “carbon footprint” (that is, how much carbon emissions is each person accountable for). In this case, the personal material footprint measures how much raw materials extraction is each consumer responsible for. The top three raw materials turn out to be metal ores (e.g. iron, copper), fossil fuels for energy (coal mining) and construction materials (e.g. cement). There are many problems with using so much stuff, according to Wiedmann. On the one hand, burning fossil fuels leads to global warming. 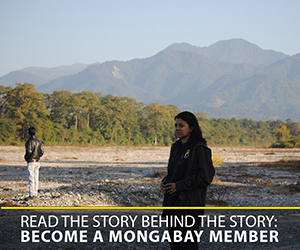 Mining can also cause dreadful local pollution in the far away country where the raw materials are extracted. But even more generally, it’s a waste of natural resources, which could not go on forever. He roughly estimates that for a sustainable future, each of us would have to decrease our material footprint to 0 tons of fossil fuels and a quarter of our current consumption for all other raw materials in the decades to come. Logging truck in the rainforests of Borneo. Photo by: Rhett A. Butler. Thomas O. Wiedmann, Heinz Schandl, Manfred Lenzen, Daniel Moran, Sangwon Suh, James West, and Keiichiro Kanemoto. The material footprint of nations. PNAS 2013. (10/30/2013) If we are to avoid catastrophic climate change, scientists say global society will need a rapid and aggressive replacement of fossil fuel energy for renewable, such as solar, wind, geo-thermal, and tidal. While experts say a renewable revolution would not only mitigate climate change but also likely invigorate economies and cut life-threatening pollution, such a revolution would not come without challenges. According to a new commentary piece in Nature Geoscience one of the largest challenges of the renewable revolution will be rising demand for metals, both rare and common. 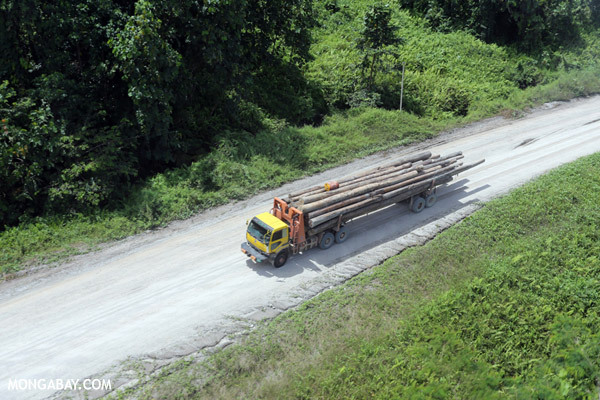 (10/24/2013) The production and trade in ‘sustainable’ timber products in Southeast Asia is mostly ‘a mirage’ due to questionable forestry practices and loopholes in import regulations, alleges a new report from Friends of the Earth International. (09/05/2013) Rob Shirkey is the founder of the Toronto-based, not-for-profit organization Our Horizon. Inspired by his grandfather’s last words to him, “Do what you love,” Shirkey quit his job and founded the organization. Our Horizon is founded on the basis that we are all responsible for global climate change through our daily collective choices. It endeavors to influence those choices, specifically with the goal of convincing municipalities to require climate change warning labels on gasoline pumps. (08/20/2013) Today is Earth Overshoot Day, according to the Global Footprint Network and WWF’s Living Planet Report, which means the seven billion people on Earth have consumed the globe’s renewable resources for the year. In other words for the next 133 days humanity will be accumulating ecological debt by overdrawing on our collective resources. (08/06/2013) Yesterday at a press event in London, two food writers took a bite into the world’s most unusual hamburger. Grown meticulously from cow stem cells, the hamburger patty represents the dream (or pipedream) of many animal rights activists and environmentalists. The burger was developed by Physiologist Mark Post of Maastricht University and funded by Google co-founder Sergey Brin in an effort to create real meat without the corresponding environmental toll. (05/27/2013) A new consensus statement by 520 scientists from around the world warns that global environmental harm is putting at risk the happiness and well-being of this and future generations. (04/30/2013) Demand for metals is likely to increase tenfold as developing economies surge ahead, putting severe stress on the natural environment, a new report from the United Nations Environment Program (Unep) has warned. The organization has suggested a novel response: bring in the mining companies—often seen as the environmental villains—to sort out the recycling. What if companies actually had to compensate society for environmental destruction? (04/29/2013) The environment is a public good. We all share and depend on clean water, a stable atmosphere, and abundant biodiversity for survival, not to mention health and societal well-being. But under our current global economy, industries can often destroy and pollute the environment—degrading public health and communities—without paying adequate compensation to the public good. Economists call this process “externalizing costs,” i.e. the cost of environmental degradation in many cases is borne by society, instead of the companies that cause it. A new report from TEEB (The Economics of Ecosystems and Biodiversity), conducted by Trucost, highlights the scale of the problem: unpriced natural capital (i.e. that which is not taken into account by the global market) was worth $7.3 trillion in 2009, equal to 13 percent of that year’s global economic output. (04/24/2013) Just 9% of the millions of tonnes of fish caught by China’s giant fishing fleet in African and other international waters is officially reported to the UN, say researchers using a new way to estimate the size and value of catches. Fisheries experts have long considered that the catches reported by China to the UN’s Food and Agriculture Organization (UNFAO) are low but the scale of the possible deception shocked the authors.